Bar-B-Cue lovers know that great BBQ food can be hard to find, and it has to be done right. 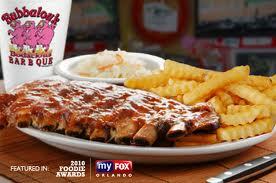 Bubbalou’s has been recognized repeatedly for having some of the best BBQ food the city of Orlando has to offer. With a mouth-watering menu of BBQ favorites that include baby back ribs and even smoked chicken, Bubbalou’s will satisfy any craving for slow-cooked, flavorful, fall-off-the-bone good BBQ. Bubbalou’s warm and friendly atmosphere invites families or groups of friends to enjoy great food and friendly service. Big-screen televisions allow you to sit back and enjoy the game while you enjoy your meal and a beer from their excellent selection. You can start your meal here with a classic appetizer like chips & queso, or try the fried pickles for a different experience. For your meal, choose from delicious pulled pork sandwiches, famous baby back ribs, beef brisket and even fried catfish. Fried corn on the cob, baked sweet potatoes, and of course house made corn bread are just a few of the side dishes on offer here. Finish with the housemaid peanut butter or pecan pie. Kids will find a great menu that includes little ones’ favorites like grilled cheese and smaller portions of the same delicious offerings grown-ups can choose from. The casual and fun atmosphere here makes it a great place for a family dinner. Be sure to ask for extra napkins for this delicious BBQ feast!